Of course, being one of the most famous places for history enthusiasts in the south of France, the site is fairly busy on most days. But by staying at the Hotel de Cite and within its walls, the visitor is able to step-back-in-time come dusk. The hotel itself is not of particularly great age, and certainly not in comparison to the medieval architecture around it (and much of that was extensively restored and reconstructed in the 19th century). However, it has certainly welcomed a fair few notable figures in its time. Alas, while the hotel possesses what it refers to as a “Golden Book” (full of celebrity signatures such as that of Johnny Depp), ascertaining whose might be in there from the early days of the establishment is difficult.. We do know, however, that the celebrated French author Collette came to stay here and thought that she had “finally come home”. 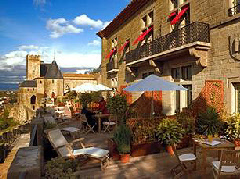 Visit the Hotel de la Cite website.